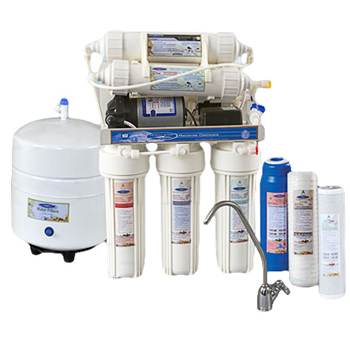 Reverse osmosis is an effective and efficient water purification technology that removes most of the contaminants and dissolved salts form water, making it clean and pure. It is essentially a system to demineralize or deionize water with the help of a semi-permeable membrane. The process gets rid of potentially harmful and toxic compounds from your drinking water and leaves the water practically distilled. A semi permeable membrane is a filter that allows certain particles to pass through while stops others from doing the same. If you have one container with water containing high contents of salt and another with low salt concentration, separated by a semi-permeable membrane, the water with low salt concentration will move towards the container with high salt concentration. This is the natural process of osmosis. With reverse osmosis, we try to accomplish the opposite by applying pressure. The water is then pushed to the other side through the membrane. The impurities are left behind as a concentrate or reject stream, and the clean and pure permeate water is obtained. pH simplified, is a measure of the activity of hydrogen ions (H+) present in water, with a minus sign. Why is RO Water Acidic? The pH of RO (Reverse Osmosis) water may be a cause for concern, however. Water is supposed to have a pH value of 7, which is neutral. But, why is it that RO water has pH between 5 and 6? Is it not dangerous? Well, to answer these questions let us try to understand what causes the pH of water to change. It is important to keep in mind that if a solution has more H+ ions, it is said to be acidic and if it has more OH- ions, it is basic. A water molecule (H2O), as you know, is composed of two parts Hydrogen and one part Oxygen. The self-ionization of water leads to dissociation of small percentage of water molecules into hydrogen ions (H+) and Hydroxide ions (OH-). When the water is devoid of any impurities, the equal number of hydrogen and hydroxide ions cancel out each other’s influence and the water remains neutral. When water is passed through a semi permeable membrane using pressure, many organic and inorganic compounds fail to pass through, however gases like Carbon Dioxide make it to the other side. CO2 combines with the free OH- ions in water to form acidic HCO3, while the H+ ions fail to find any substance to interact with as most of the impurities have been removed through the RO process. As a result, water has a positive balance of H+ ion, lowering its pH and making it acidic. (Again, remember, pH is measure of H+ with a minus. No more chemistry further, we promise!). The greater the amount of CO2 in your water, the greater is the drop in pH level. However, there is no reason to be alarmed, as the acidity of RO water is weak. A couple of specks of baking soda are enough to neutralize glassful of RO water. If the pH tests of your tap water show that your household is receiving acidic water, it can be dangerous. Acidic water is corrosive and can interact with lead, copper, zinc and other metals in the plumbing and piping to increase the toxicity of your drinking water. These metals can be detrimental to the health and well-being of your family. However, drinking contaminants free water with low pH levels or high acidity is perfectly safe. Your body does a great job of maintaining a near neutral pH of 7.4 at all times. When you drink slightly acidic water, it loses its acidity the moment it comes in contact with saliva in your mouth and food in your stomach. Your stomach is a highly acidic place with pH value of 2. Do not think that slightly acidic water is going to have any impact on changing the pH of your stomach or will negatively affect your health short term. Granted, US population consumes primarily acidic food and beverages, and long term effects of this can be detrimental. Most fruit juices are acidic in nature, and you know how some of them, the ones with no added sugar, are great for your health. There are many other highly acidic beverages you use every day without giving it a second thought. Did you know that Soda or carbonated drinks have a pH value of around 2.5 and that the pH of Coffee is 4? Slightly acidic RO water pales in comparison to most drinks we consume. Average tap water in the United States has pH levels of 6 to 8.5 as well. "If you have any health issues, or are trying to lose weight, you should stop consuming acidic and sugar-added drinks. It is best to balance acidity in your diet with a pH-neutral or even slightly alkaline purified water." If you have any health issues, or are trying to lose weight, you should stop consuming acidic and sugar-added drinks. It is best to balance acidity in your diet with a pH-neutral or even slightly alkaline purified water. In this case, a water purifier with balanced pH is a must. 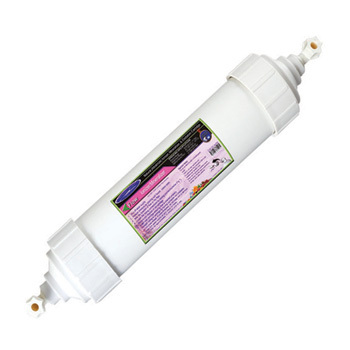 Because of the long-term cumulative effect, we suggest using alkaline re-mineralizer cartridge on the RO systems. So why not give an extremely pure and clean RO water a go! RO water allows you to access almost unparalleled levels of purity when it comes to your drinking water. 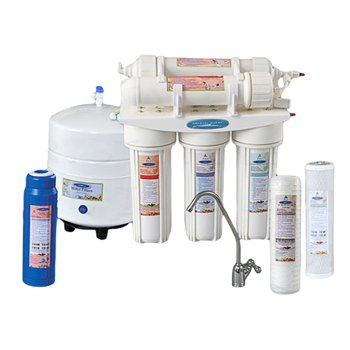 Choosing the right RO filter is important to enjoy all the benefits of clean water. 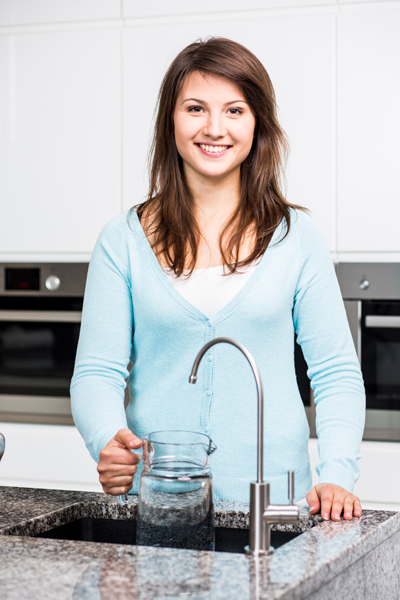 If you are looking to combine the assurance of RO water with convenience, an Under sink Reverse Osmosis System makes perfect sense. And for offices, an RO-enabled filtered water cooler is a must. Best systems employ the benefits and efficacies of Ultrafiltration membranes may provide close to 100% pure and contaminant free water. The Thunder 4000MP RO and UF System with Pumpis just the system. 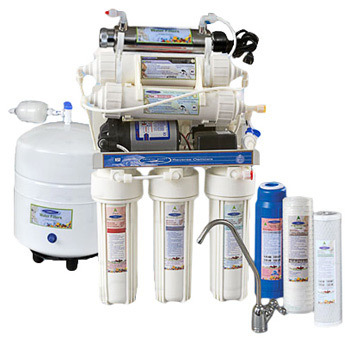 It is fully loaded with a comprehensive 17-step reverse osmosis process, with dual Ultrafiltration membranes as well as Ultraviolet cartridge to offer absolutely pure drinking water. Particles as small as one thousandth of a micron are trapped by the filtration cartridges and the semi permeable membrane. The system removes more than 500 organic and inorganic contaminants from water. The system comes with a booster pump for low-pressure water in your household. The compact nature of the system means it is easy to fit under your kitchen sink. The surprising capacity and efficiency of the system allows you to access as many as 100 gallons of pure drinking water each day. A four gallon steel pressurized holding tank is installed with an ultraviolet cartridge to prevent microbial growth. Reverse osmosis is a sure fire way to ensure the water you and your family members are drinking is free from toxic chemicals, heavy metals, insecticides as well as bacteria and virus. The low pH value of RO water is essentially harmless and if you want to raise the pH of RO water and improve its taste, combining an Alkalizing, Re-mineralizing and Oxidation Cartridge with your RO system may be the best way to do that (add it to your order with any new RO system and we'll install it).